Show grace and mercy to the animals entrusted into our care and find them homes. 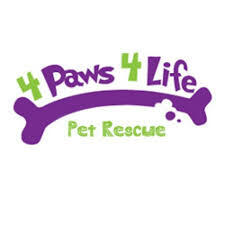 4 Paws 4 Life Dog Rescue is a non-profit organization dedicated to rescuing dogs from overpopulated, high-kill shelters and contributing to achieving a no-kill nation. We work with committed volunteers, local veterinarians, trainers, boarding facilities, shelters and other rescue partners to save dogs each year by: Partnering with like-minded organizations to achieve a common goal of saving animals. Providing dogs with temporary care through our foster programs and/or boarding facilities. Ensuring they receive medical care using our local veterinarian services. Ensuring successful placements using our application and interview processes. Finding them loving homes during our weekly adoption events program. Educating adopters and the general public on responsible pet care and relationships. Hiring trainers, when necessary, to assist with behavioral issues.